The East Side Gallery is a 1316 m long section of what remains of the Berlin Wall. In the middle of the night of August 12, 1961, the Communist government of the German Democratic Republic began to build a wall made of barbed wire and concrete between East and West Berlin. The Wall was officially referred to as the “Anti-Fascist Protective Wall” and its purpose was to keep “Western fascists” from entering East Germany and undermining the socialist state. Rather than protecting anything, the wall encouraged radical political changes throughout the Western and Eastern Bloc. It was the reason for a mass defection of Germans from the state, and it symbolized the oppression and the political unrest of the Cold War. After the Second World War, what remained of Germany was divided into 4 occupational zones, each one controlled by 1 of the 4 occupying allied powers: The United States, The United Kingdom, France and the Soviet Union. The capital of Berlin was divided into 4 sectors, fully within the Soviet Zone. Current Soviet leader, Joseph Stalin, revealed to German communist leaders that he expected to “slowly undermine” the British position within their occupational zone, and that a united communist Germany would finally have power. Professors, students, and other citizens who opposed the new indoctrination of Marxism-Leninism to the school curricula fled to the West to seek independence from Soviet power. As a result, The Soviet Union instituted the Berlin Blockade, which prevented food, materials, and supplies from arriving in West Berlin. This was answered by massive food and supply “airlifts” sent from Canada, The United States, Britain, France, and several other countries. The economy in West Germany continued to flourish, as the Soviet army gained full control over the East German military and secret police structures. The tension in East Germany continued to grow, and more Easterners craved to move to the West. Those caught attempting to leave East Berlin were met with heavy penalties, but with the access to the subway train and no physical barrier, it became increasingly easier to emigrate westward. By 1960, 3.5 million East Germans left. This totaled approximately 20% of the entire East German population. Officials in East Germany feared that a large amount of well-educated youth fleeing from the East would result in a significant loss of working professionals in the state. The number of engineers, technicians, physicians, teachers, lawyers and skilled workers continued to decrease as emigration increased, and the East German communist frontier was threatened. Western powers portrayed the Wall as a symbol of communist tyranny. It was more than 87 miles long, equipped with barbed wire and armed guards. During the time of the Wall, more than 5,000 people attempted to emigrate to the Western side, and many deaths occurred as a result. The wall encouraged a revolution in the German youth and the citizens of the world. It was denounced by both United States sitting presidents, and the subject of relief concerts, books, and other media of the time. Today you can visit the wall and experience its remains physically destroyed by enraged and righteous citizens of both sides. Today, Germany stands united in a democratic society. Take a day to explore the Mauer Museum. Discover objects used to escape over, under, and through the Berlin Wall, and read the stories of those escapees who risked their lives to win their freedom. The exhibits keep the memory of others who died in the attempt alive, and you can be part of this important work. Experience an exhilarating German adventure on the Euro Focus, and Great Escape tours with AESU. 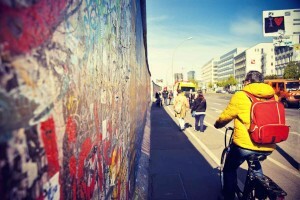 Visit the remains of the Berlin Wall, and experience the history of revolution! This entry was posted on Wednesday, November 30th, 2016	at 2:29 pm	. You can follow any responses to this entry through the RSS 2.0	feed. Both comments and pings are currently closed.